Photopills is a powerful new smartphone app combining sun and moon position prediction, location shoot planning and instant calculators for exposure, depth of field, time lapse sequences and much more. Not only can it predict the position of the sun and moon at any time anywhere on Earth, but actually allows you to specify the exact celestial alignments for a perfect composition you have pre-visualised and then tell you exactly when to turn up for the perfect previsualised picture. As you set up, you can point your smartphone at the scene and use Photopills' augmented reality feature to watch how the sun and moon will progress through your composition when the time comes. Later, you can save your plannings, add photos and then share them on social network sites. Many of you will already have used The Photographer’s Ephemeris (TPE) to plan location shoots and will want to know how Photopills compares. Like most serious landscape photographers, I have been a big fan of TPE for years and it is a tough act to even equal, never mind surpass. TPE is so good at what it does that none of us is going to bother with an app that is just another TPE clone. When I began assessing Photopills for this review, I was sceptical, but within a week it won me over; I will explain why as best as I can. At first sight the two apps do look similar. Both have map page layouts with two moveable pins, one for the camera position and another (Photopills calls it the obstacle pin) for something in the landscape that you want to feature in your composition (mountain top, natural arch, island etc). Lines on the map show the directions of the sun, moon, sunrise, sunset, moonrise and moonset on the chosen day. Altitude information is extracted from the map data so that you can take into account the effect of relative elevation on the timing of moonrise, sunset etc. You can manipulate the timeline using your understanding of celestial movement (or by trial and error if you are like me) until everything lines up just as you wanted. Both apps are equally powerful and use similar buttons and menus. Where Photopills surpasses TPE is that you can specify what direction and elevation you want and do a search for dates and times when they occur. You can fine tune the search by altering the allowed error (default 2%); the search results for both sun and moon give a nice visual representation of the light quality (daylight, twilight, 'golden hour', 'blue hour' etc), and the phase of the moon is also shown. If lots of results are returned, you can alter the error % or re-order the list to prioritise the best light or the fullest moon, or whatever you want. In seconds you have the best possible date and time that you need, with no need to ‘play about with the sliders until it looks right'. This is a real game changer. Here is a real example if you are sceptical. On the Photopills map, I chose an exotic location where a famous mountain is reflected in a lake. I positioned my virtual tripod on the lake shore and placed the objective pin on the mountain top. This told me the precise direction and elevation, which were then automatically imported by Photopills into my planning search. I manually tweaked the elevation up a couple of degrees to allow space for a moon just above the summit. I wanted that moon illuminated by a rising sun behind me. Probably not a common occurrence I thought, so I set the date search limits to five years (the maximum allowed), clicked the search button and Photopills took just four seconds to tell me what I needed to know. It turns out that the precise moon alignment that I wanted will occur about 20 times in the next five years, but on only one date will there be a full moon at sunrise. I know that date but I am not telling you, you will have to buy the app to find out. The range of map options are the three default Apple maps and three versions of the open source maps OpenStreetMap or OpenCycleMap. Unlike TPE, Photopills does not offer Google Maps yet. Google Terrain is my favourite map for location planning, but OpenCycleMap's landscape version comes pretty close as you can see in this screen grab. The advantage of open source maps is that once accessed they remain for a while in the cache memory so are still available even if there is no phone network at the location. Another feature of Photopills that I was a bit sceptical about initially is Augmented Reality. This uses astronomical data plus the smartphone compass and gyro sensors to show you celestial features in the sky as you point the phone at it. If you have the excellent astronomical app Night Sky, you will know exactly what I mean. The nice part is that the paths of the sun and moon are overlaid over the smartphone camera view so that you can see how they will move through the sky as the day (or night) progresses. Photopills do warn that inaccuracies occur due to electrical interference and limitations in the phone sensors, so I would regard this feature as not essential but quite fun and reassures that your plan is really going to work. 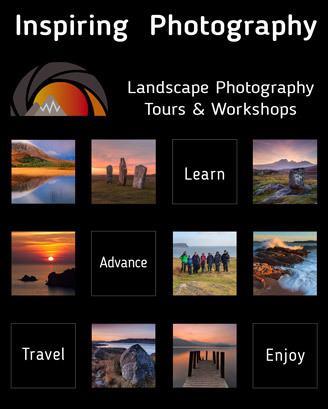 In addition, Photopills contains a number of handy application modules for photographers. ‘Exposure' can be used to calculate the shutter time for a long exposure based on a test shot taken at a fast aperture and high ISO – very useful. ‘DoF’, ‘Hyperfocal Table’ and ‘FoV’ are pretty self-explanatory and do a good job. I particularly like the way the developers have incorporated a way of adjusting the CoC value in their ‘Advanced DoF’ calculator by allowing the user to input camera sensor size, print size, viewing distance and even visual acuity. The ‘Night Augmented Reality’ and ‘Star Trail’ modules really allow you to visualise how a star trail picture will look. The ‘Time Lapse’ module takes all the hard calculation work out of planning a time lapse sequence. The app has excellent help files built in and the developers’ web site at www.photopills.com contains useful video tutorials including one about the planning and making of this spectacular sunset through a natural rock arch, taken at Pont d'en Gil in Menorca by Spanish photographer Antoni Cladera. Photopills retails on iTunes App Store at €8.99 in Europe, £6.99 in the UK and $9.99 in the US and is available in English, Spanish and Catalan. I think it is priced very competitively for such a seriously useful app. The developers are all photographers and are committed to further enhancements in the future. They tell me that an updated version to utilise fully the higher resolution iPad screen will be out later this year and they are working on an Android version also. If you do not already have TPE on your iPhone, it is an obvious choice. Even if you do have TPE you will not be wasting your money. Like me, you will soon appreciate just how much further this great little app goes.